Finding tracks on your iPhone by playlist, artist, or song is cool, but finding them with Cover Flow is even cooler. 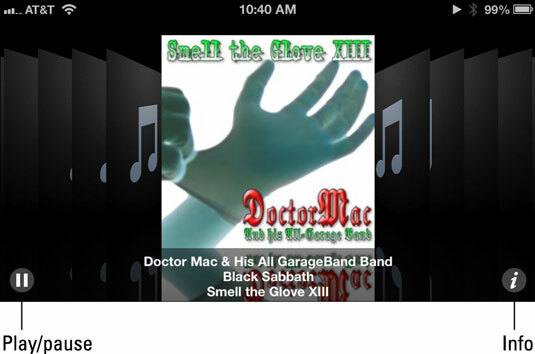 Cover Flow lets you browse your music collection by its album artwork. To use Cover Flow, turn your iPhone sideways (long edges parallel to the ground) and Cover Flow will fill the screen. The only time you won’t see Cover Flow while your iPhone is turned sideways is after tapping the More icon. Flipping through your cover art in Cover Flow is simple. All you have to do is drag or flick your finger left or right on the screen and the covers go flying by. Flick or drag quickly and the covers whiz past; flick or drag slowly and the covers move leisurely. Or tap a particular cover on the left or right of the current (centered) cover and that cover jumps to the center. To see tracks (songs) on an album: Tap the cover when it’s centered or tap the info button (the little i) in the lower-right corner of the screen. The track list appears. To play a track: Tap the track name in the list. If the list is long, scroll by dragging or flicking up and down on it. To go back to Cover Flow: Tap the title bar at the top of the track list or tap the little i button again. To play or pause the current song: Tap the play/pause button in the lower-left corner.